For the weekend only, for Amazon Prime members only, the recent movie “Arrival” is on sale for $5 in Digital HD, without any ads at Amazon Instant Video. This is “digital ownership”, not a movie rental. You can watch it forever once you buy it! PS: you only see the sale price IF you are logged on to your Amazon account AND you are a Prime member. Otherwise you will see the regular price. If you like to digitally-own movies, you can get the Prometheus movie in HD (without ads) for $5 at Amazon Instant Video. This is not a rental but “digital ownership”. You can watch it as much as you want as long as you want. But you can’t sell it or give it away to other people like you can with a DVD or Blu-Ray. This is a limited time sale, but it’s not a lightning deal. If you like to rent movies in HD online, and watch without annoying ads, good until 4/17/17, Amazon Instant Video is offering 99c rentals of Tom Hanks’s Inferno movie. Once you rent it, you have 30 days to begin watching. Once you begin watching, you have 48 hours to finish it. If you don’t begin watching within 30 days, you lose it, and you get no refund. PS: I don’t know if this is eligible for digital credits ~ if yes, then you can watch it for free if you have $0.99+ in slow-shipping or other Amazon promotional credits. If you place a pre-order for the Star Wars Rogue One movie in digital HD at Amazon Instant Video, you are entitled to receive two free digital comic books at Comixology. They are two specific #1s, of Star Wars (2015-) and Darth Vader (2015-). Amazon owns Comixology so you can just login with your regular Amazon account there, you don’t need to create a new one. The promotion runs until April 30, in 2017, so it will also be good after the movie gets released (purchases instead of pre-orders). Here are the terms of this promotion. 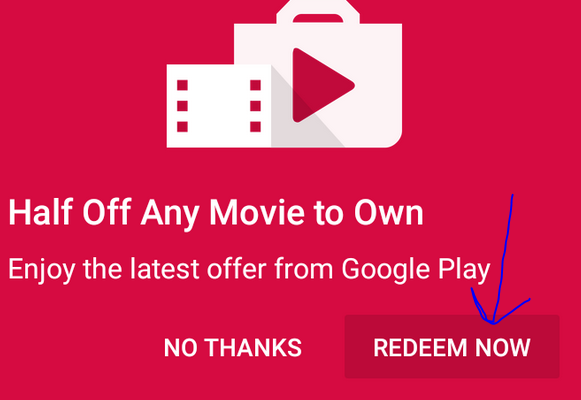 While putzing around Google Play, be on the look out for a new promotion that gets you half-off the digital purchase (not rental) of a movie. The offer shows up when you are wondering about. You have to click the “Redeem Now” in the app. Once you do, the offer will show up in your Google Play account under the “Account” category, further down under the “Rewards” section. You can see them all there, and they include the expiration date too. There are hundreds of movies available, along with nearly 600 documentaries and two dozen TV shows. TV shows are its weakest point, the most famous of them is Syfy’s Dresden Files. Documentaries are perhaps your best bet with this service, as they feature a variety of topics, including some good choices on music (both performance and meta). Movies are older but there’s a lot of them, and they are recognizable, it’s not like it’s filled with straight to DVD movies 🙂 You get titles such as “Carrie”, “Margin Call”, “Phantom of the Opera”, “Star Dust”, “Aeon Flux”, Star Trek Nemesis”, “Dead Man Walking”, “Midnight Cowboy”, “Narc” and more. If you like to rent movies digitally (and you actually end up watching them within the 30 days before they expire), Amazon has a hot new 99c Weekend Rental promotion. These are ad-free movies in HD that you can watch at some point within 30 days after you rent them. If you don’t watch them, you don’t get a refund, you lose the money. TIP: Better yet, if you are a Prime member, you can automatically use the “slow shipping” digital credits towards the payment for these rentals, so you may end up paying nothing out of your pocket if you have some credit. It is typically $1 per slow-shipment, so it’s essentially one movie per credit. The credits do expire eventually, so if you are close to expiration (check the emails that Amazon sends when these are earned, there is no simple way to get to the expiration dates as far as I know), this may be one way to use them without spending any additional money. PS: you can rent as many of these as you want. If you previously redeemed any of the Vudu $5.50 store credit offers through T-Mobile Tuesdays, check your email address that is associated with your Vudu account. 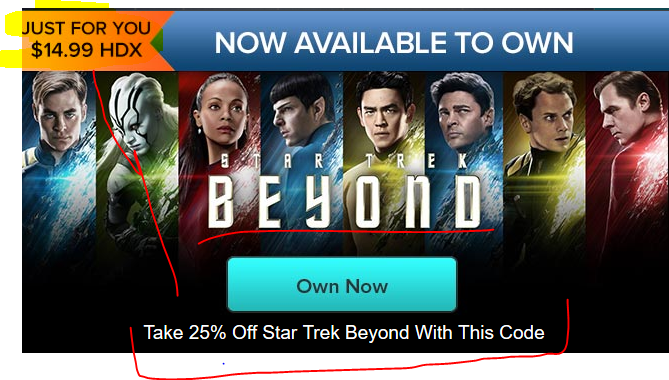 You may find a unique coupon code that gets you 25% off the current price of the brand new “Star Trek Beyond” movie. The current price for the HDX (1080p) digital copy is $20, so the coupon make it $15. The coupon must be used by 10/17/16 at 11:59pm ET and can only be used once and only for this particular title. Regardless of where you buy the movie, Vudu is planning a Viewing Party using the social media hashtag “#VuduViewingParty” at 9pm Eastern on Friday 10/7/16. Vudu won’t be airing the movie, you have to own it on your own and play it on your own, and follow people’s commentary using the social media hashtag.